BioGenex is the inventor of Antigen Retrieval enabling technology. Antigen Retrieval is an effective way of unmasking antigenic epitopes on the surface of formalin-fixed, parraffin-embedded tissue sections using microwave heating. Covered by exclusive patents issued to BioGenex, this method to recover antigenicity in formalin-fixed, paraffin-embedded tissue sections has been routinely practiced in laboratories throughout the world. The Antigen Retrieval technique breaks the formalin induced cross-linking bonds between epitopes and unrelated proteins, thereby allowing better penetration of antibody and accessibility of epitopes. Different antibodies require different conditions for Antigen Retrieval. H&E Microwave or Room Temp. 25-100°C Best for burnt, overfixed or dried FFPE tissues, over-DeCal (bone marrow biopsies) and fragile/over processed specimens (e.g. needle biopsies). Can be used at room temp. for some frozen tissue sections and tissues with freezing artifacts. DeCal Room Temp. 20-25°C For acid-decalcified bone marrow & formalin-fixed tissues embedded in paraffin or celloidin. * See datasheets for BioGenex recommended Antigen Retrieval for each specific antibody. Unique superheating properties increase the availability of antigenic epitopes in tissues. EZ-AR 1 EZ-Retriever or Microwave, 107°C Citric acid based, PH~6, excellent for most BioGenex Antibodies*. 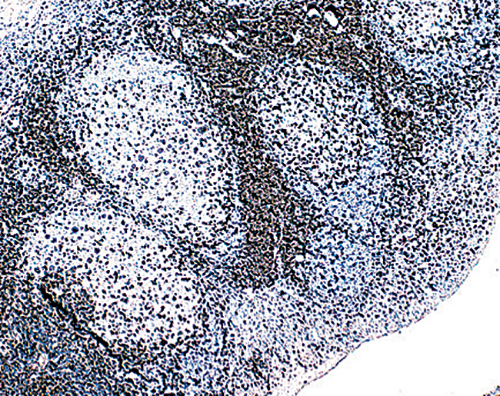 EZ-AR 2 EZ-Retriever or Microwave, 107°C EDTA based, PH~8.5, for antibodies such as Ki67 (EP5), CD5 (EP2952) and NGF Receptor (EP1039Y)*. Optimized for Xmatrx with standardized protocols for all BioGenex antibodies. Reaches 107°C without boiling to minimize evaporation and preserve morphology. EZ-AR 1 Elegance Xmatrx Automation Works at 100-105°C Citric acid based, PH~6, excellent for most BioGenex Antibodies*. EZ-AR 2 Elegance Xmatrx Automation Works at 100-105°C EDTA based, PH~8.5, for antibodies such as Ki67 (EP5), P27 (Y236) and P53 Protein (DO7)*. 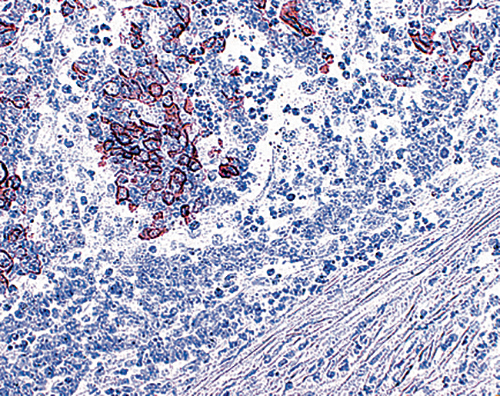 Breast Carcinoma tissue stained with Anti-Progesterone Receptor [PR88] MAb, using AEC chromogen without Antigen Retrieval. 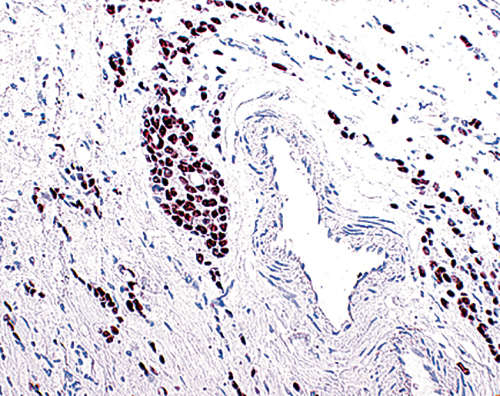 Breast Carcinoma tissue stained with Anti-Progesterone Receptor [PR88] MAb, using AEC chromogen with Antigen Retrieval using Citra. 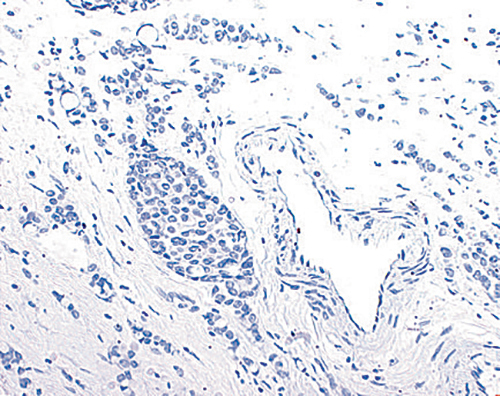 Breast Carcinoma tissue stained with Anti-Estrogen Receptor [ER88] MAb, using DAB chromogen with Antigen Retrieval using Citra Plus. 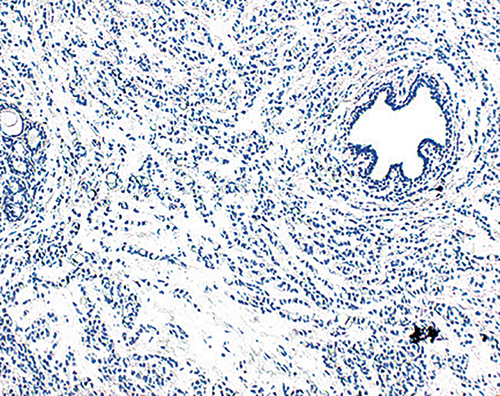 Tonsil tissue stained with anti-CD3 MAb using DAB chromogen without Antigen Retrieval using AR-10. 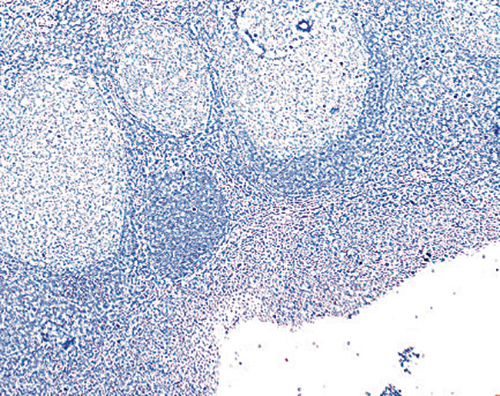 Tonsil tissue stained with anti-CD3 MAb using DAB chromogen with Antigen Retrieval using AR-10. 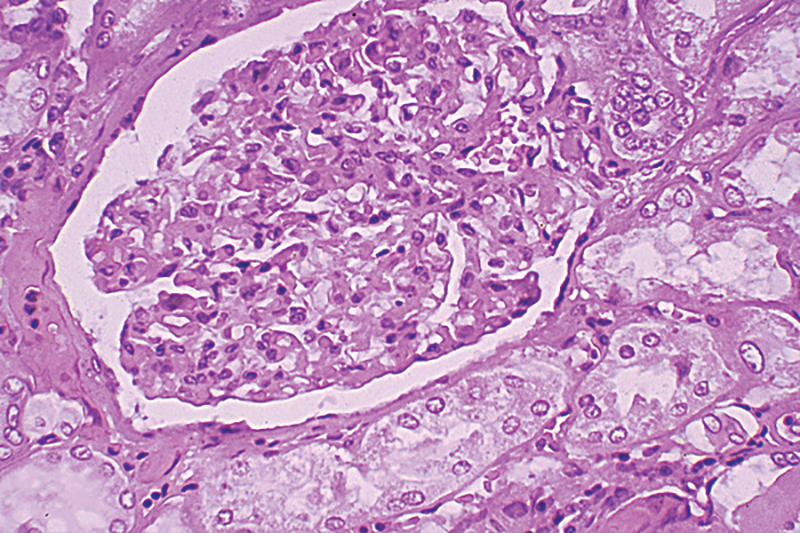 Burnt kidney tissue stained after standard pre-treatment. Nuclear data restored by microwave heating in H&E Solution. Some tissues require the use of enzymatic pre-treatment before staining to achieve standardized results depending on the antibodies and their different incubation and pre-treatment requirements. Each kit contains three or four vials of lyophilized enzyme powder and 15 ml of reconstitution buffer, enabling you to make fresh enzyme solutions as needed. The Trypsin and Pepsin kits contain well-established enzymes suitable for routine pre-treatment at 37°C. 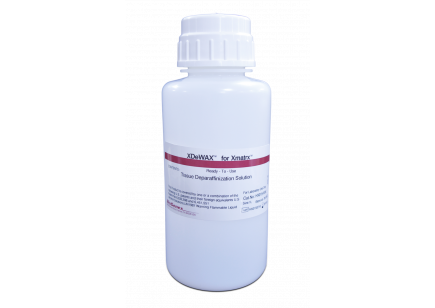 Protease XXIV kits contain a universal digestive agent that allows for fast and effective pre-treatment at room temperature. The diastase (Alpha-amylase) catalyzes breakdown of starch. 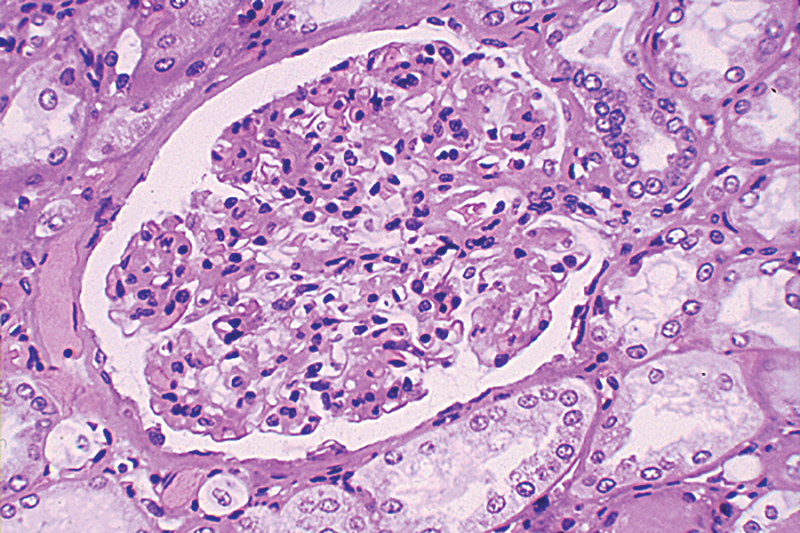 Diastase is often used prior to periodic acid-Schiff (PAS) staining (See Special Stains section) and is useful as an aid in the evaluation of glycogen storage disease. Proteinase K in a ready to use (RTU), RNase-free solution. 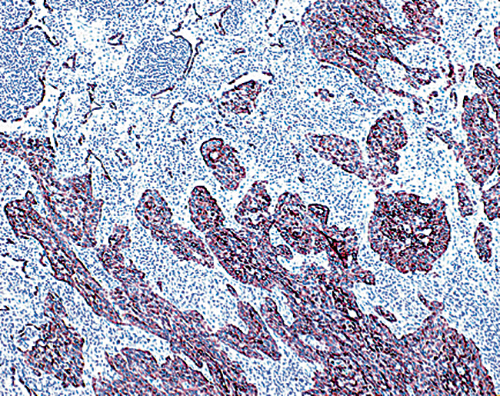 Leiomyoma tissue stained with Factor VIII MAb using AEC chromogen following Pepsin Pre-treatment. 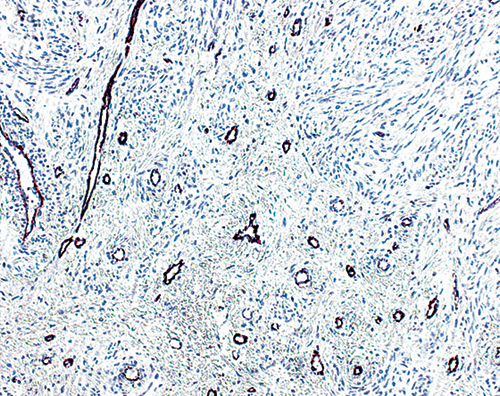 Squamous Carcinoma tissue stained with Anti-Cytokeratin (High Molecular Weight) MAb using AEC chromogen following Trypsin Pre-treatment. BioGenex deparaffinization solutions are “one-step” products that simultaneously enable the removal of paraffin and allow rehydration of the tissue with a single reagent. In the past, formalin-fixed, paraffin-embedded tissue sections were deparaffinized with highly toxic, noxious chemicals (i.e. xylene, equivalents). 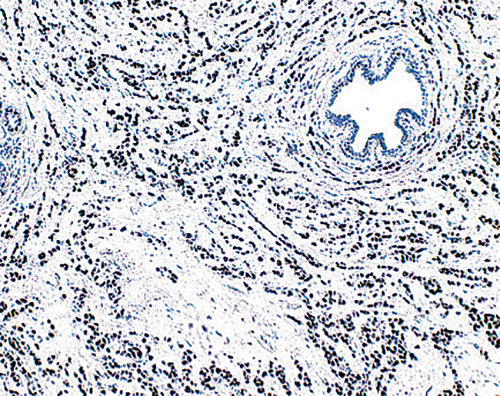 BioGenex, a pioneer in the Immunohistochemistry technology, offers xylene-free products that remove the paraffin from mounted tissue slides easily and rapidly. EZ-DeWax Solution is for all BioGenex manual methods. 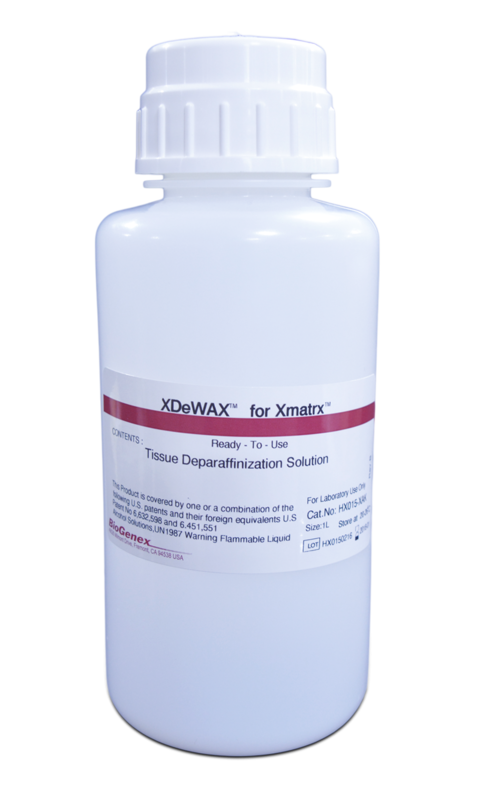 X-Dewax Solution is optimized for Xmatrx automation. Effectively removes paraffin and allow rehydration of the tissue in one step. Reduces deparaffinization time from 45 minutes to 10 minutes. Eliminates use of toxic solvents (Xylene) and minimizes hazardous waste. Ready to use (RTU) or 2x solutions (to be diluted 1:1 with ethanol) are available. EZ-AR Common Solution is for microwave facilitated deparaffinization. Conveniently perform deparaffinization and Antigen Retrieval in the same slide tank using microwave heating. Quick deparaffinization & rehydration in one step (10 minutes @ 70°C default protocol). Reduces the use of alcohol in preparing tissue sections for IHC, ISH, H & E, FISH and Special Stains. Optimized for use in EZ-Retriever microwave with BioGenex EZ-AR 1-4 solutions.